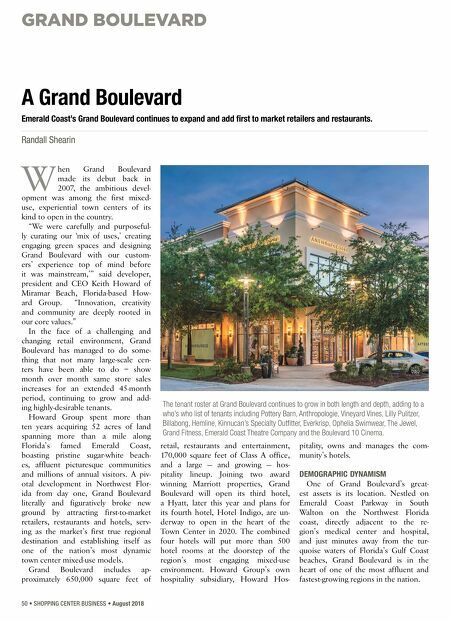 GRAND BOULEVARD 50 • SHOPPING CENTER BUSINESS • August 2018 W hen Grand Boulevard made its debut back in 2007, the ambitious devel- opment was among the first mixed- use, experiential town centers of its kind to open in the country. "We were carefully and purposeful- ly curating our 'mix of uses,' creating engaging green spaces and designing Grand Boulevard with our custom- ers' experience top of mind before it was mainstream,'" said developer, president and CEO Keith Howard of Miramar Beach, Florida-based How- ard Group. "Innovation, creativity and community are deeply rooted in our core values." 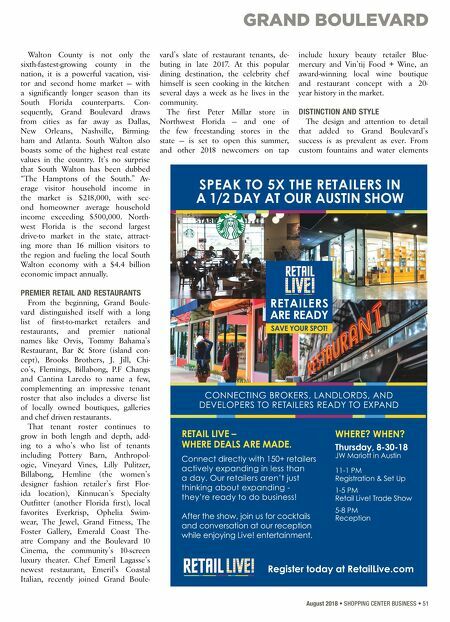 In the face of a challenging and changing retail environment, Grand Boulevard has managed to do some- thing that not many large-scale cen- ters have been able to do – show month over month same store sales increases for an extended 45-month period, continuing to grow and add- ing highly-desirable tenants. Howard Group spent more than ten years acquiring 52 acres of land spanning more than a mile along Florida's famed Emerald Coast, boasting pristine sugar-white beach- es, affluent picturesque communities and millions of annual visitors. A piv- otal development in Northwest Flor- ida from day one, Grand Boulevard literally and figuratively broke new ground by attracting first-to-market retailers, restaurants and hotels, serv- ing as the market's first true regional destination and establishing itself as one of the nation's most dynamic town center mixed-use models. Grand Boulevard includes ap- proximately 650,000 square feet of retail, restaurants and entertainment, 170,000 square feet of Class A office, and a large — and growing — hos- pitality lineup. Joining two award winning Marriott properties, Grand Boulevard will open its third hotel, a Hyatt, later this year and plans for its fourth hotel, Hotel Indigo, are un- derway to open in the heart of the Town Center in 2020. The combined four hotels will put more than 500 hotel rooms at the doorstep of the region's most engaging mixed-use environment. Howard Group's own hospitality subsidiary, Howard Hos- pitality, owns and manages the com- munity's hotels. DEMOGRAPHIC DYNAMISM One of Grand Boulevard's great- est assets is its location. Nestled on Emerald Coast Parkway in South Walton on the Northwest Florida coast, directly adjacent to the re- gion's medical center and hospital, and just minutes away from the tur- quoise waters of Florida's Gulf Coast beaches, Grand Boulevard is in the heart of one of the most affluent and fastest-growing regions in the nation. A Grand Boulevard Emerald Coast's Grand Boulevard continues to expand and add first to market retailers and restaurants. Randall Shearin The tenant roster at Grand Boulevard continues to grow in both length and depth, adding to a who's who list of tenants including Pottery Barn, Anthropologie, Vineyard Vines, Lilly Pulitzer, Billabong, Hemline, Kinnucan's Specialty Outfitter, Everkrisp, Ophelia Swimwear, The Jewel, Grand Fitness, Emerald Coast Theatre Company and the Boulevard 10 Cinema.